Rangers’ Canadian youth defender Luca Gasparotto has gone back out on loan, this time to Greenock Morton. The 20-year old CB was out on loan at Airdrieonians already last season, and returned in May, but finds himself exiting again this time for Cappielow. Gasparotto’s entire time at Ibrox has been punctuated with loans, and the North American has not managed to breach the first team, reportedly having an especially poor match versus Alloa, which the U20s lost 5-2. His contract expires next summer and one can only assume he will be released when that time comes, or will find his contract terminated (with mutual consent, of course) when his latest spell away from Ibrox expires. 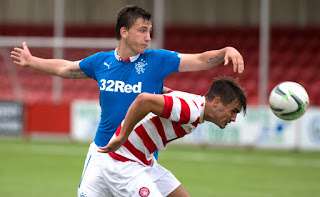 I am pleased that 20 year old Rangers’ Canadian centre half Luca Gasparotto is now out on loan to Morton until January 2016. If he has a great 5 months playing regular first team football, it will be a big benefit to us. He was a huge success with Airdrie last season and at only 20 he has time on his side to eventually make it at Ibrox. The boy is totally over rated.I've seen him play many a time and he's just not good enough.All the best to him though. Jelavic. What' s happening wae the big man, could be wort another crack under warns?